A new, combination fungicide product has been released by Kenso NZ for the control of a wide range of diseases in cereals. Kenso NZ has launched Avior Gold which contains 80 grams per litre of Epoxiconazole and 120 grams per litre of Azoxystrobin. Epoxiconazole, a DMI protective and curative fungicide and Azoxystrobin, a Strobilurin protective and curative fungicide, have broad spectrum activity against a wide range of fungal diseases in Wheat, Barley, and Rye Grass Seed crops. The DMI’s and Strobilurin fungicides have been successfully used in major cereal growing markets for many decades. Avior Gold Fungicide is a combination fungicide with the DMI as a contact, protectant and eradicant; and with the strobilurin as a systemic, translaminar, protectant and anti sporulant which when used together will provide up to 6 weeks disease control. Avior Gold Fungicide has curative activity against early stages of many fungal infections and also controls the late season disease complex in cereals when applied from flag leaf emergence. Applications made to crops over the flag leaf to head emergence growth stages will provide significant green leaf area retention that can contribute to yield increases. The disease spectrum that Avior Gold controls includes: Leaf Rust, Net Blotch (Spot and Net form), Scald, Powdery mildew, Didymella leaf scorch, Ovularia leaf spot, Late season head disease complex (Alternaria, Cladosporium, Microdochium nivale, Stemphylium),Eyespot, Speckled Leaf Blotch, Stripe Rust, Glume Blotch, Ear disease complex, Crown Rust (Leaf Rust), Stem Rust and Downy mildew. Avior Gold Fungicide should not affect beneficial species including parasitic wasps, hover flies, lacewings and honeybees. Kenso NZ’s Regional Manager Andrew Fulford said Avior Gold is one of an increasing portfolio of specialised formulations being developed by Kenso. “We are delighted to be able to offer this innovative combination of two well proven fungicides to our New Zealand Cereal grower customers. 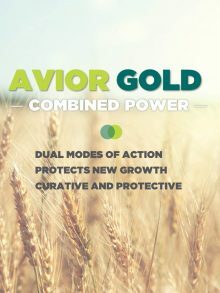 As a combination product of two completely different active chemistries Avior Gold will assist with managing fungal resistance in Wheat and Barley crops and will offer expected increases in fungicidal efficacy with the two actives working in synergy. Avior Gold also offers the simplicity of a ready to use single formulation combining two actives – thereby reducing measuring and mixing requirements”. Avior Gold is available through selected agrochemical distributors throughout New Zealand in cartons containing 4 x 10L packs of product. For more information, contact Andrew Fulford (Kenso NZ Regional Manager) on 027 444 4694 or Josh Nicholls (South Island Sales Manager) on 027 636 5639. Josh Nicholls Josh Nicholls has been appointed South Island sales manager for KENSO New Zealand. NZ regional manager Andrew Fulford says this is a new role for the company, and one he’s delighted to fill, reflecting as it does growing market support. “We welcome Josh aboard and look forward to his involvement with the continued development and expansion of the KENSO NZ business. 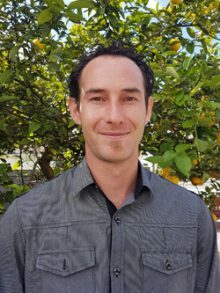 This has now reached a point where additional feet on the ground are needed and Josh’s background provides the ideal credentials for such a role.” Nicholls’ background includes agribusiness, customer services, business administration and logistics. Andrew Fulford says Josh will be responsible for sales management and development for the entire South Island region, while Fulford continues with overall country management and North Island sales management. Based in Christchurch, Josh Nicholls will bolster KENSO NZ’s presence in the Mainland and provide more accessible, face to face high level customer service and support for South Island customers. Outside of work his interests include hockey, basketball and netball. Josh Nicholls can be reached at: 027 636 5639 or emailed at: joshua@kenso.co.nz.